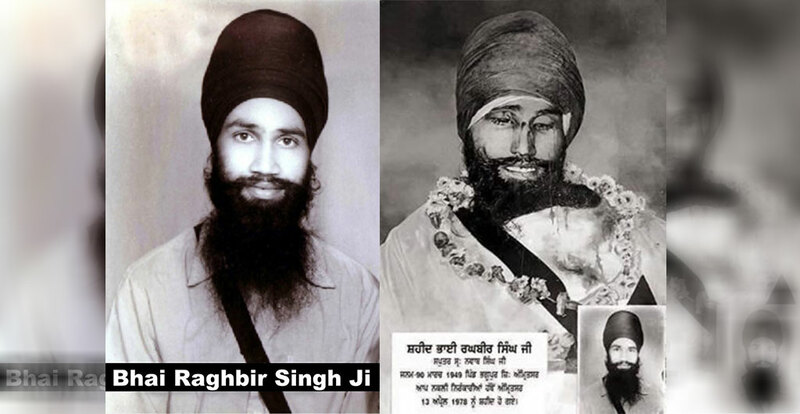 Shaheed Bhai Raghbir Singh Ji was born in the village of Bhaggupur in Patti in the district of Amritsar on 10th March 1949 at the house of Sardar Nawab Singh. He was educated in his own village up to the age of fifteen and then joined the army in the Bombay Engineering Group in Kirki, Puna. He stayed there for five years before resigning from the Army in 1968 and settled down in Patiala. In 1967, a year before he left the army, Bhai Raghbir Singh had received the gift of Amrit-Naam and had quickly become stricter in his code of conduct. Within a short time period, he had memorized many Bani’s, which he would recite daily. Within the army, you were not allowed to prepare your own food, so he sought the assistance of a local Amritdhari couple who lived nearby. After retiring from the army, Bhai Raghbir Singh started work at the Sura Printing Press in Patiala at sixty Rupees a month where he always made his own food, and afterwards he moved to work for the Parkash Printing Press. Bhai Raghbir Singh had always been very interested in studying. He would study and do his Nitnem daily and work all day in the press. He found all this difficult, so he left his job and concentrated on his Naam Simran and studies from 1968-1973. At this time Gurmat Parchar was being carried out in the area. Bhai Raghbir Singh and Bhai Fauja Singh would carry out the Sewa of the Panj Pyare during the Amrit Sanchar Smagams. Bhai Raghbir Singh spent a lot of time with Bhai Manohar Singh Ji of the Red Cross and Bhai Surjeet Singh Ji in Patiala. 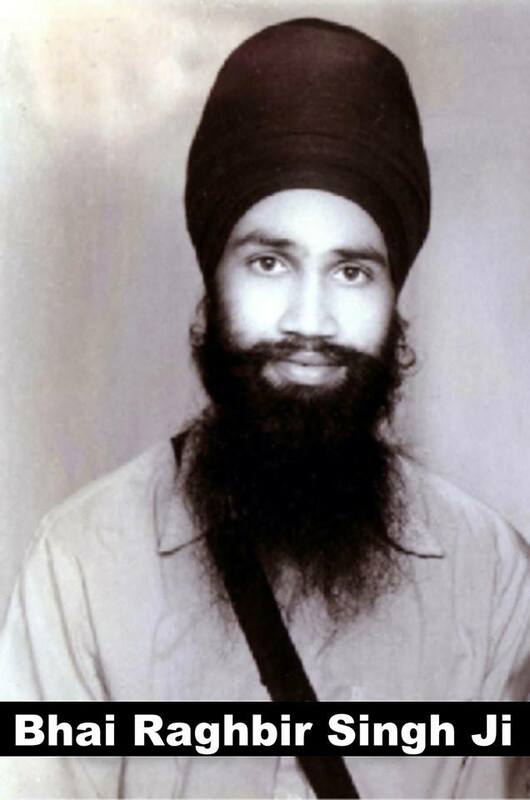 Bhai Raghbir Singh always spoke very sweetly and was a very sociable person. At Amrit Vela he would do Naam Abyass for many hours and it would sound as if many Gursikhs were sitting together. Many people were influenced by his Jivan and became Gursikhs. Bhai Raghbir Singh always used to share his earnings with others. After the Bhog of the Paath following his Shaheedi, one Gursikh remembered him by saying that a Gursikh should share one-tenth of his earnings with others, but Bhai Sahib used to live on one-tenth of his earnings and spend the rest on religious causes. His Anand Karaj took place on 18th October 1975 to Bibi Hardev Kaur, daughter of Captain Sardar Ram Singh (retired), from the village of Batala in Karputhla. This Anand Karaj was also unique in that he himself, his father and four other Gursikhs were present and there were no musicians or any milni. Bibi Ji was also very strict in her Rehat and Bhai Sahib became even more influenced with Bibi Ji’s Sangat and started wearing Bana. Bhai Raghbir Singh lived in Sunam for three and a quarter years. Due to his efforts, Rainsbhai Kirtans were held there every year. Bhai Raghbir Singh travelled from Sunam to be present at the Akhand Kirtani Jatha Vaisakhi Smagam. When, Bhai Raghbir Singh heard of the Nirankari’s actions on the sacred day of Vaisakhi, he acted in accordance with the Guru’s teachings – ‘Gur Ki Ninda Suneh Na Kaan’ – he went forward to face the bullets, sticks and swords yielded by the Nirankari’s. Bhai Raghbir Singh received bullets to his chest, blows to his skull and his bones were broken by the lathi’s. He left behind his wife and two children, one whose age were one and half years and the other only five months at the time of his Shaheedi.